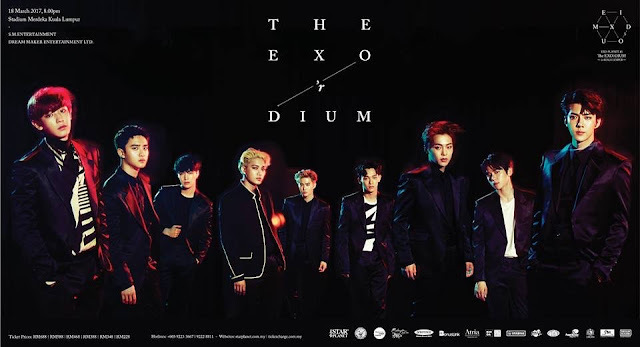 We bet many of you know that EXO will be returning to Malaysia on 18 March 2017 (Saturday) for EXO PLANET #3 - The EXO’rDIUM in Kuala Lumpur. This would be the most anticipated concert that EXO-Ls are looking for in 2017. The organizer Star Planet has received overwhelming responses and inquiries regarding the details of the show, today, Star Planet has officially announced the ticket launch which will be held on 14 January 2017 from 11am to 5pm at Atria Shopping Gallery (1st Floor, Event Hall). Online booking is available on the same day from 5pm onwards while appointed ticket outlets will start ticket sales on 15 January from 11am onwards. During the ticket launch, each person is allowed to purchase a maximum of 6 tickets and will be receiving a concert poster. Each ticket holder will entitle to a lucky draw to win express entry pass or merchandise. Ticket price: RM688, RM588, RM468, RM388, RM348 and RM228 *subject to RM4 processing fee. BonusLink Member who shows virtual card via BonusLink Mobile App will receive cash vouchers worth from RM10 to RM30. The first 100 lucky people in line will receive an RM30 cash voucher. Purchase RM5 of any Spritzer brand products in a single receipt between 9 to 14 January 2017 to get an RM10 cash voucher. Maximum of 2 cash vouchers per person, up to 1,000 cash vouchers to be given away on a first-come-first-served basis. Spend RM50 and above in a single receipt at any KIODA outlets to get an RM10 cash voucher. Like KIODA Facebook & show a photo of EXO in your phone upon redemption. EXO PLANET #3 The EXO’RDIUM in Kuala Lumpur is brought to you by Star Planet and supported by Malaysia Major Events. 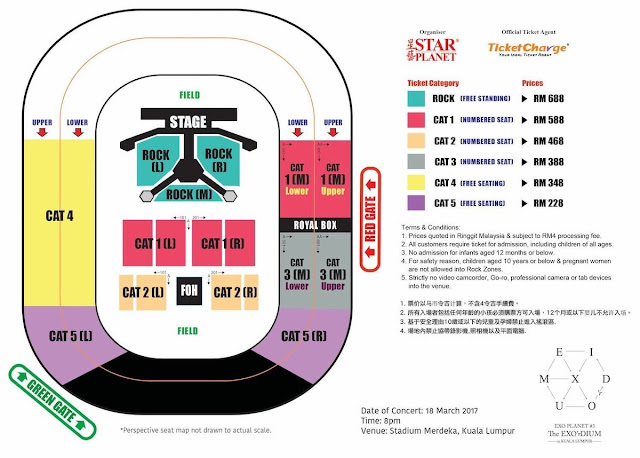 For more concert information and promotions, please visit www.starplanet.com.my or www.ticketcharge.com.my or call +603 9223 3667 / 9222 8811.